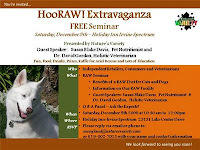 Benefits of Raw Pet Food--Natures Variety HooRAW Extravaganza! 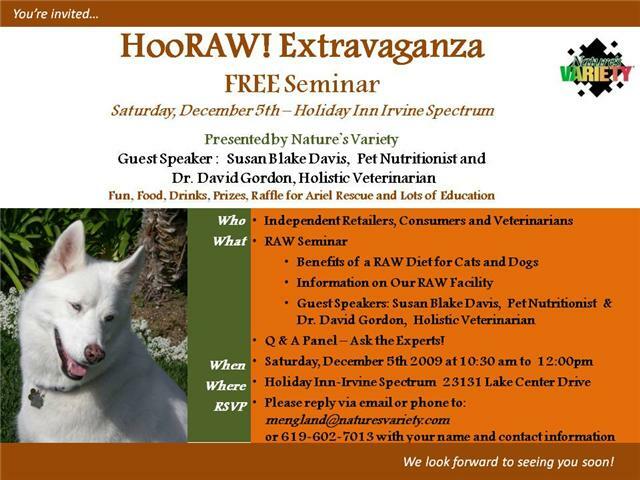 If you live in Southern California and have heard about the benefits of raw pet food but weren't sure if it was right for your pet, please come to our FREE seminar on Saturday December 5th at the Holiday Inn in Lake Forest from 10:30am - 12:00. We want to spread the word about holistic veterinary medicine, raw pet food and help some homeless dogs too. Michele England from Natures Variety will be discussing how raw food is made and the benefits for pets. Susan Blake Davis, Pet Nutritionist will be discussing holistic veterinary medicine and nutritional supplemens for pets and Dr. David Gordon, holistic veterinrian will be discussing acupuncture and chiropractic for pets. Dr. Gordon and Susan Davis offer telephone and inperson appointments to pet owners all over the world. To learn more, click here.